1959 Cadillac Coupe de Ville - Click for more photos! Is this the ultimate fifties car? Perhaps the ultimate in excess and for many, it is their dream car. However you feel about the 1959 Cadillac it is probably up there in the Top 5 most recognizable fifties cars along side classics like the 1957 Chevrolet. Those extra large tail fins and the dual bullet tail lights make it very easy to identify - you can't miss them! It's become an icon of the 50s. Is the '59 Caddy your ultimate fifties car or was it a step too far? This 1959 Cadillac Coupe de Ville is presented here in Ebony. It's done 119,000 miles since it was new. The original sales brochure stated; CADILLAC for 1959 presents the new realm of MOTORING MAJESTY. For the Sixty-Two Coupe they told us the magnificent interior fabrics include Camden cloth in hues of gray, blue and fawn with matching leathers... silver-black Coronado with white leather... green Coronado with green metallic leather... turquoise black Coronado with turquoise metallic leather.... and rose Coronado with rose metallic leather. Quite a choice - you can tell they were trying to achieve living room status with those interiors! Cadillac’s for 1959 were powered by a 390 cubic inch V8 – that’s 6.4 liters – producing 325 bhp. 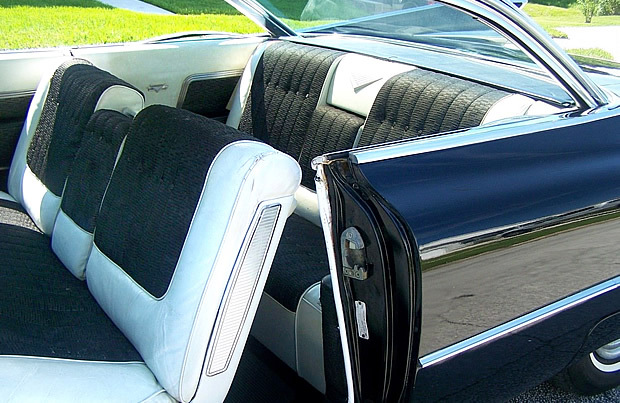 Other standard equipment for ’59 included power brakes, power steering and Hydra_matic automatic transmission with the DeVille series (6300) adding power windows and two-way power seats to that list. DeVilles are recognizable over the standard 62 series by the presence of script nameplates on the rear fenders. 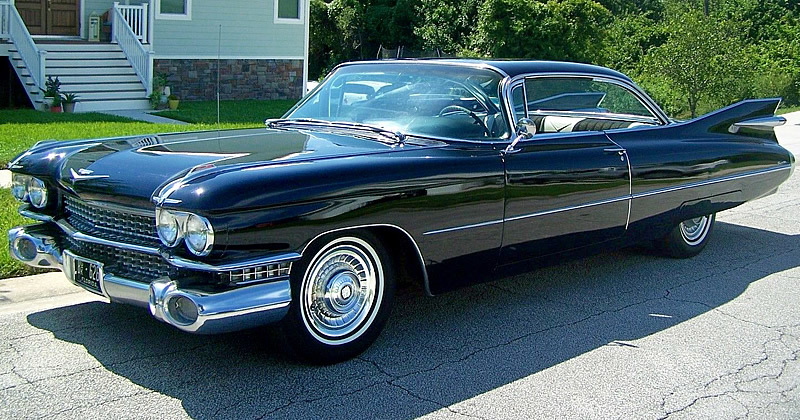 Cadillac made 21,924 Coupe DeVille’s during the 1959 model year. With a base price of $5252 is was definitely aimed at a higher end market. Compare this with a 1959 Chevrolet Impala 2 door Sport Coupe that had a base price of $2599, you can see it is more than double – and Impala was Chevrolet’s higher end range!